A new ransomware virus spreads through the Remote Desktop Protocol (RDP) found on many computer systems. Its real name is Xpan, but many victims and some researchers refer to it as TeamXRat ransomware. The name TeamXRat comes from the cybercriminals who developed the ransomware and left their name in the ransom note as signature. The extension .___xratteamLucked is appended to files which get encrypted. The ransomware originates from Brazil, but residents of other countries may get infected as well. To remove the virus and see how you can decrypt your files, read this article carefully. Short Description The ransomware distributes by exploiting weak passwords in the Remote Desktop Protocol (RDP). From there is loads the Xpan Trojan horse and infects the files on a compromised PC. Symptoms The virus will append the .___xratteamLucked extension to the files, which it encrypts. User Experience Join Our Forum to Discuss TeamXrat. The TeamXRat virus is unique in the way it infects compared to other ransomware viruses. It utilizes targeted attacks, by brutе forcing servers via the Remote Desktop Protocol (RDP). The Windows Operating System has a Remote Desktop Connection implemented in it and it may be turned on by default. Other operating systems also have an equivalent program running the same protocol, which makes it viable for a hacker attack. Once a weak password is cracked with the brute-forcing method, it is immediately exploited. The Xpan ransomware Trojan is being installed after the hackers manually set off the Anti-virus software found on the server they have entered. However, it is not excluded for the TeamXRat virus to be spread in other ways. Some of these ways include malicious spam e-mail campaigns or using networks like social media or file-sharing services. On there a malicious file containing the payload of the malware could be placed. If you interact with it, especially by executing it, your whole computer machine will get encrypted. Before opening files with an unknown origin, perform checks on them for their signatures, size, and also scan them with a security tool. You should see more tips for ransomware prevention in our forum thread. The Xpan Trojan virus is what many people have dubbed TeamXRat. That is largely due to the fact that this ransomware had the signature TeamXRat in its ransom note and on the wallpaper it sets after file encryption. 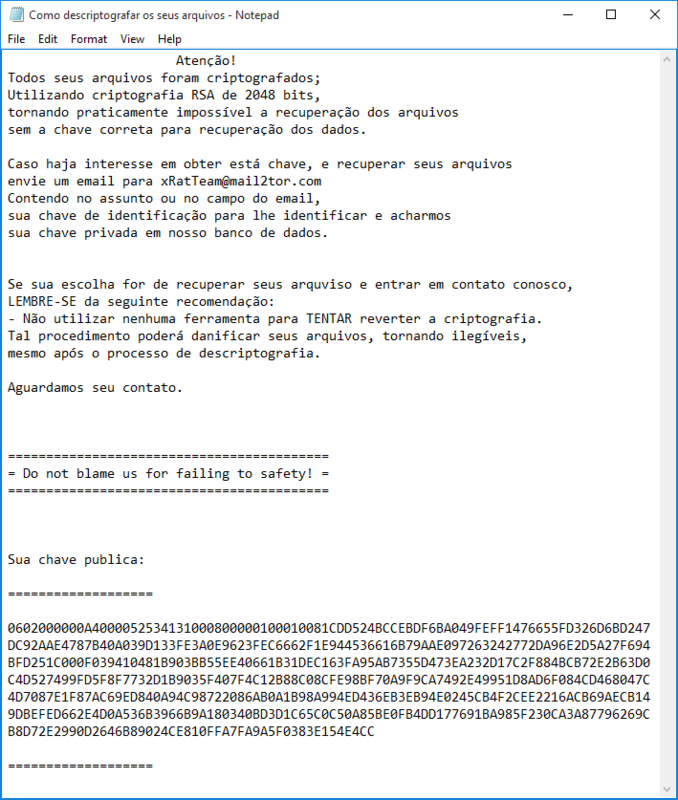 The ransomware is developed by the Brazilian criminals identifying themselves as TeamXRat or CorporacaoXRat (CorporationXRat). Although the virus originates from Brazil and most compromised computers are in Brazil, people from other countries have also fallen victim to this cyber threat. The cybercriminals TeamXRat have developed other ransomware before, which is known as the Xrat ransomware (Xorist). They have improved their newest ransomware with a stronger encryption algorithm. They write about the encryption algorithm which is used, demand one Bitcoin for payment and the e-mail addess [email protected] is given for you to contact the cyber crooks. Do not even think of paying the malware makers as nobody can guarantee you will get your files back after successful payment. The money will undeniably be used for financially supporting further criminal activity, like the development of a new ransomware or even worse. The TeamXRat ransomware is very likely to delete the Shadow Volume Copies found on your Windows operating system. After encryption the ransomware deletes some of the files it originates from, including the payload file. Continue reading and down below you will see how to remove the virus completely and what you can try to decrypt your files. If your computer got infected with the TeamXRat ransomware cryptovirus, you should have some experience in removing malware. You should get rid of this ransomware as quick as possible before it can have the chance to spread further and infect more computers. You should remove the ransomware and follow the step-by-step instructions manual given below. Check out ways in which you can try to recover your files by seeing the step titled 2. Restore files encrypted by TeamXRat or wait to see if there is an official decrypter released. Threats such as TeamXrat may be persistent. They tend to re-appear if not fully deleted. A malware removal tool like Combo Cleaner will help you to remove malicious programs, saving you the time and the struggle of tracking down numerous malicious files. Threats such as TeamXrat may be persistent on your system. They tend to re-appear if not fully deleted. A malware removal tool like SpyHunter will help you to remove malicious programs, saving you the time and the struggle of tracking down numerous malicious files. Note! Your computer system may be affected by TeamXrat and other threats. SpyHunter is a powerful malware removal tool designed to help users with in-depth system security analysis, detection and removal of threats such as TeamXrat. 1. Install SpyHunter to scan for TeamXrat and remove them. 2. Scan with SpyHunter, Detect and Remove TeamXrat. Ransomware infections and TeamXrat aim to encrypt your files using an encryption algorithm which may be very difficult to decrypt. This is why we have suggested several alternative methods that may help you go around direct decryption and try to restore your files. Bear in mind that these methods may not be 100% effective but may also help you a little or a lot in different situations. Note! Your computer system may be affected by TeamXrat or other threats. Remove TeamXrat by cleaning your Browser and Registry. Fix registry entries created by TeamXrat on your PC. Combo Cleaner is a powerful malware removal tool designed to help users with in-depth system security analysis, detection and removal of threats such as TeamXrat. Step 5: In the Applications menu, look for any suspicious app or an app with a name, similar or identical to TeamXrat. If you find it, right-click on the app and select “Move to Trash”. Step 6: Select Accounts, after which click on the Login Items preference. Your Mac will then show you a list of items that start automatically when you log in. Look for any suspicious apps identical or similar to TeamXrat. Check the app you want to stop from running automatically and then select on the Minus (“–“) icon to hide it. Remove TeamXrat – related extensions from your Mac’s browsers. A pop-up window will appear asking for confirmation to uninstall the extension. Select ‘Uninstall’ again, and the TeamXrat will be removed. When you are facing problems on your Mac as a result of unwanted scripts and programs such as TeamXrat, the recommended way of eliminating the threat is by using an anti-malware program. Combo Cleaner offers advanced security features along with other modules that will improve your Mac’s security and protect it in the future. 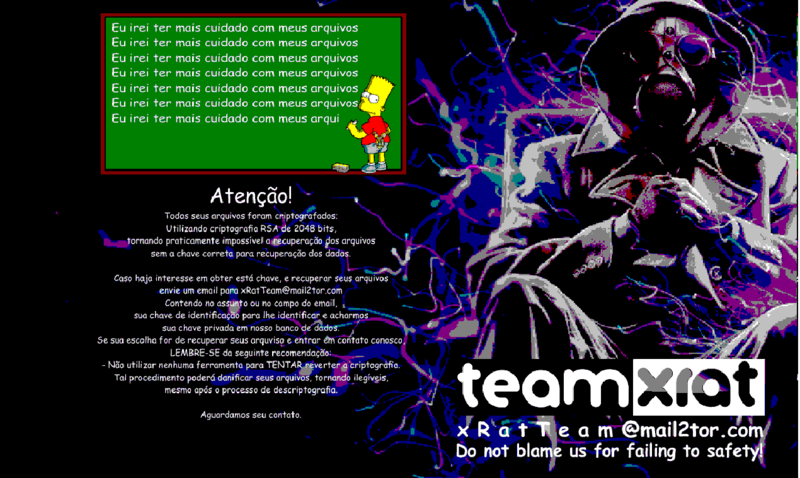 Hey !, I found this information for you: "TeamXrat Virus (Xpan) – Remove and Decrypt .___xratteamLucked Files". Here is the website link: https://sensorstechforum.com/teamxrat-virus-xpan-remove-decrypt-___xratteamlucked-files/. Thank you.